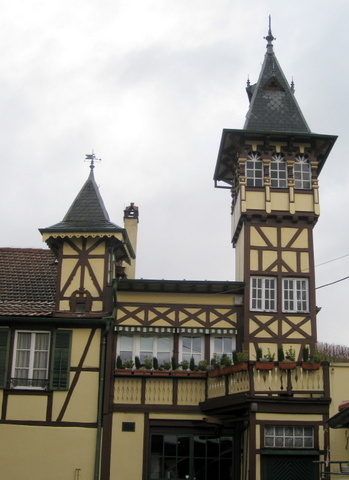 The Trimbach family and their distinctive timbered and turreted property seem so firmly anchored in Ribeauvillé that it’s easy to suppose they must have been here for ever. The celebrated dynasty has indeed been based in Alsace for centuries: the first Jean Trimbach came originally from the eponymous town in Switzerland, arriving at the beginning of the 17th-century with the wave of settlers invited to re-populate Alsace after the ravages of the Thirty Years War. He established himself initially in Riquewihr, where in 1626 he was made a burgher of the town. Some 200 years later Jean’s descendants moved to Hunawihr, where in 1839 Frédéric Emile was born. He was to become a pivotal figure in the family’s history, establishing the reputation of Trimbach wines on the international stage. His initials, F.E., live on in the firm’s title and his name is honoured in their Riesling Cuvée Frédéric Emile. Finally, at the conclusion of the First World War, the family transferred operations to Ribeauvillé. The dynastic tradition of this great winemaking family continues undiminished. Today the firm is presided over by elder statesman, Hubert, with nephews Pierre and Jean playing leading roles as winemaker and export director respectively. Hubert is enjoying semi-retirement, having shared export responsibilities – and a punishing travel schedule – with Jean for many years. Similarly, Pierre understudied his father Bernard (now retired) for several years before taking over as chief winemaker in 1985. The allocation of key roles in a family business can be a tricky one. As luck would have it, the two brothers’ particular skills dovetail perfectly and each clearly enjoys huge job satisfaction. Jean, urbane and multi-lingual, travels the world spreading the Trimbach message, spending at least two months a year in the States. David Schildknecht, who for many years reported on Alsace for The Wine Advocate, refers to the family’s “ambassadorial status in the US”. Pierre, the only one actually living ‘above the shop’, is most often to be found in Ribeauvillé watching over his wines with an eagle eye. And Pierre’s daughter Anne, who represents the thirteenth generation of the family, now aids Jean. After the US, the next biggest market is France, where their wines figure on all 26 three-star Michelin restaurants. Serge Dubs, head sommelier at the Auberge de l’Ill and a Meilleur Sommelier du Monde, recalls that back in the 1970s Trimbach wines were “already making eyes sparkle”. He pays a warm tribute to the strength of this family enterprise, which has managed to evolve steadily while maintaining the famous Trimbach style. Ah, the ‘Trimbach style’. It is invariably characterised as dry, sometimes steely, even a touch austere. Pierre finds an insistence on ‘dryness’ to be reductive and simplistic, as if the mere absence of sugar was some kind of automatic guarantor of quality. He prefers the term ‘balanced’ (“the rest is blah, blah, blah”). In theory, it’s not hard to make dry wine. In practice, as he observed at a recent conference at the Lycée Viticole in Alsace, it’s difficult to make a great dry wine. As guardian of the Trimbach style, Pierre is widely admired. Shy and self-effacing, he shrugs off the multiple plaudits, insisting that “wine comes first of all from terroirs, not from the hand of the winemaker”, adding with a sheepish grin: “well, maybe a bit – after all, I was voted [by Decanter, in 2006] as one of the world’s top ten white winemakers”. Thierry Meyer, regional Alsace chair for Decanter’s World Wine Awards, tips his hat to Trimbach, not only for their iconic Clos Sainte Hune and Cuvée Frédéric Emile wines but also for their ability to produce large volumes of reliably good, widely available and affordable Riesling and Gewurztraminer. Behind this stands Pierre’s expertise and experience in blending the fruits (both own and purchased grapes) from the different parcels that make up the mosaic of the Trimbach vineyards. Their 43 hectares of vines are scattered over seven different communes, including many in the top grands crus. Most famous is the precious 1.67-hectare Clos Sainte Hune, a south-facing limestone enclave that sits snugly inside Grand Cru Rosacker, with vines averaging 50 years old. They also own vineyards in Grand Cru Osterberg and Geisberg, and have recently added to their Geisberg holding by leasing vines from the nuns of the Couvent de Ribeauvillé (“Protestant wines from Catholic vines”, observes Pierre, almost managing to keep a straight face). So what has prompted the change in thinking on grand cru? Jean downplays the suggestion that Trimbach was ever vehemently opposed, preferring to say they were “not happy” with the original set-up. But today, he admits, things have improved a lot. A new generation of wine-buyers and sommeliers know (and respect) the leading grands crus and it would be “unthinkable to buy 1.6ha of top vineyards today in Grand Cru Schlossberg and not label the wines as such”. How well these newborns will ultimately rub along with their famous Clos Sainte Hune, Cuvée Frédéric Emile and Seigneurs de Ribeaupierre siblings – and above all, where they will fit into the already well-established hierarchy – remains to be seen. If there seems to have been a revolution in thinking on the grand cru front (“it is a bit of a scoop”, admits Pierre ruefully), other changes have been more evolutionary. In the vineyards, pruning is shorter than in the past and yields are now no more than 55hl/ha for Riesling and 45hl/ha for Pinot Gris and Gewurztraminer (compared with ceilings of 80-96 hl/ha for Alsace AOC and 55-66hl/ha for Alsace Grand Cru, across all varieties). Chemical fertilisers have been outlawed on the estate since 19521972, and Pierre was one of the first to introduce confusion sexuelle techniques, which drastically reduce insecticide use. 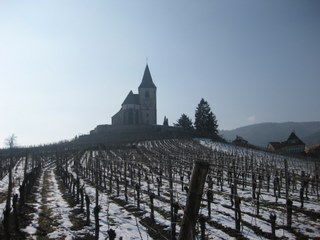 Since 2009 Clos Sainte Hune has been farmed along organic lines, a development that most winegrowers would trumpet from the rooftops, but which chez Trimbach has gone largely unnoticed. Pierre sees it simply as a logical development of their already established viticultural philosophy. It’s fashionable to look back to a supposed golden age when all Alsace wines were dry (unless late harvest or botrytised) and to bemoan an apparent swing to sweetness – though there’s evidence that this particular pendulum is ripe for correction. 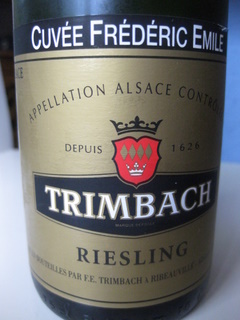 Meanwhile Maison Trimbach continues quietly and without fanfare to do what it has always done best: making fine, upstanding, beautifully balanced wines that encapsulate what David Schildknecht defines as “the classic, dry profile of Alsace wine”.